James Palmer married Rachel Sophia Pickering in Swanbourne in 1809. They had a daughter Jane christened in Swanbourne in 1809 and then they left the village. They returned about 1820 and Samuel James Palmer was born in Swanbourne in 1821 and was christened on 6th August 1821. A second son Charles was born at Liphook in Hampshire in 1825. In the 1841 census, James Palmer was living in Swanbourne with his children Samuel James and Charles. James Palmer died in Swanbourne in 1853 aged 75, leaving his sons Samuel James and Charles. Samuel James Palmer, 1stson of James and Rachel Palmer,married Mary Coy (1825-1890) at Little Horwood in 1844. In 1848 Samuel and Mary Palmer left Plymouth and emigrated to Australia on the “Lady Peel” arriving on 16th February 1848 at Port Phillip Bay. At Geelong in Australia they had two children: Samuel James Palmer (1850-1931) and Charles William Palmer (1853-1914). 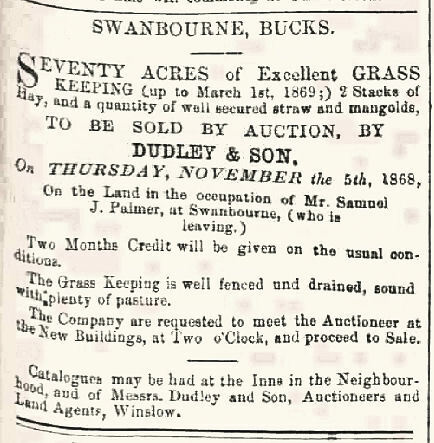 They then returned to Swanbourne where Samuel James Palmer Senior is recorded in the 1861 census as a tenant farmer of 121 acres employing 3 men and 2 boys, and they had his mother-in-law Rachel Coy living with them. Artist’s Impression of the likely appearance of the old Godwin Manor House which the 1861 census details suggested Samuel Palmer was renting as a farmhouse before intended demolition in 1869. 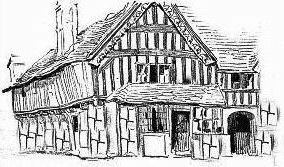 The farmhouse that they rented was opposite the entrance to St. Swithun’s Church. Sir Thomas Francis Fremantle had acquired this farm and land and demolished the building in about 1870. The motivation to leave may well have been the Palmer family receiving notice by the Fremantles to vacate the farmhouse that they were renting, to produce parkland between the new Swanbourne House (under construction) and the Old House (the original Swanbourne House). 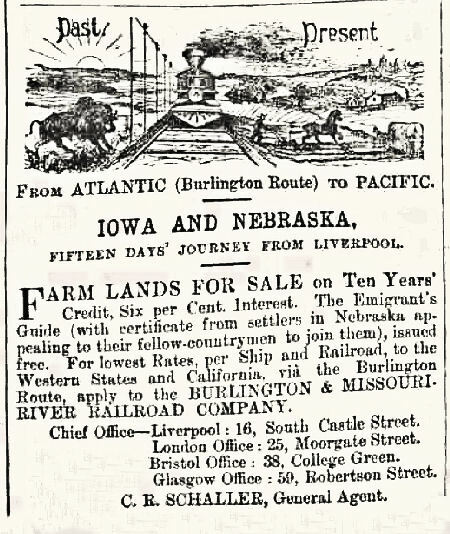 Looking to own land rather than rent, they were attracted by Bucks Herald advertisements for affordable farmland to buy in Nebraska and Iowa, USA. Nebraska had just been admitted to statehood in 1867 and millions of acres of cheap land were available for sale. Land was being sold by the Burlington and Missouri River Railroad Company on ten years credit at 6% interest. Ships left from Liverpool which took 15 days to get to Nebraska. 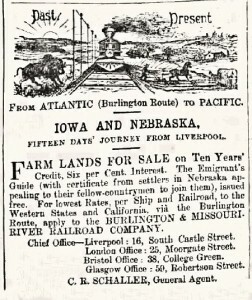 1860’s Bucks Herald – Advertising land sales in Iowa and Nebraska. 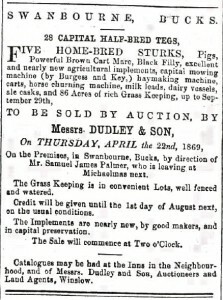 1868 First Swabourne Palmer Auction. 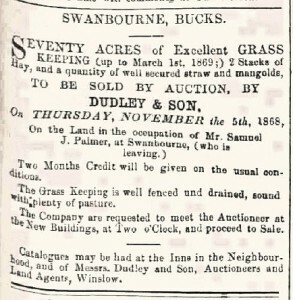 On 5th November 1868 Samuel J. Palmer auctioned 70 acres of grazing (advertised on the front page Bucks Herald 31st October 1868). 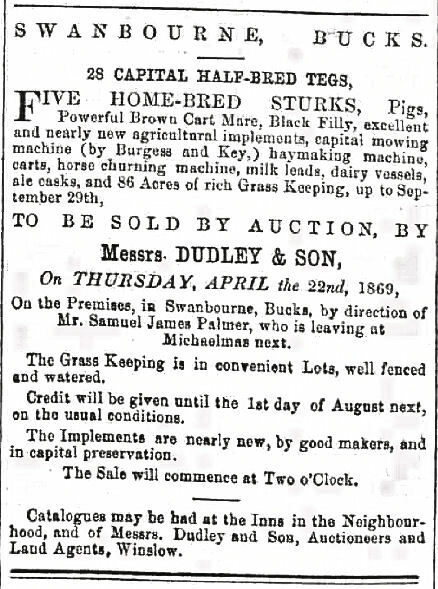 On 23nd April 1869 Samuel J. Palmer auctioned the rest of his farm of 86 acres, including livestock and equipment (advertised on the front page Bucks Herald 10th April 1869). At the end of September 1869 Samuel J. Palmer with his wife and 2 sons emigrated again, this time to Nebraska in the United States of America. At the same time James John Painter Harrison of Buckingham Road, Winslow also emigrated and settled at Palmyra. They were some of the first settlers at Palmyra in Nebraska near the border with Iowa. On 1st September 1877 the Bucks Herald carried a death notice “PALMER. — At Palmyra, Nebraska, United States, on the 5th ult., Mr Palmer, late of Swanbourne, aged 57 years.” His descendants still live in the western states of the USA today. Charles Palmer, 2nd son of James and Rachel Palmer, married Ann Cutler Hedges (1838-1863) of Stewkley in 1857 and they had children in Swanbourne. 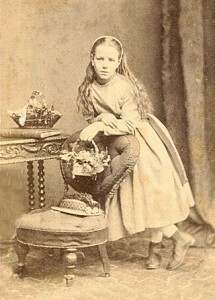 Elizabeth Fanny was born in 1858 but died in 1860 and Louisa Ann was born in 1859. In 1861 Charles and Ann Palmer were living with their one year old daughter Louisa Ann Palmer. 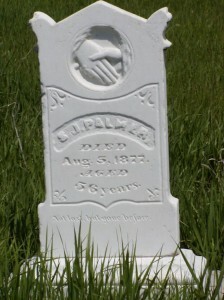 Mrs Ann Palmer died in 1863 aged 25. 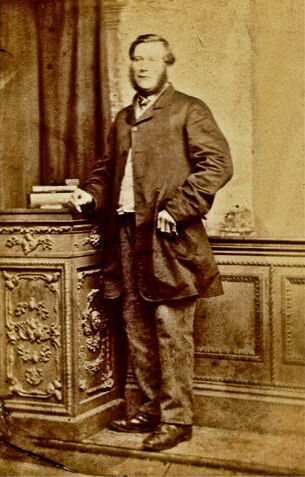 In 1871 Charles Palmer was then living as a widower, with his son Charles Richard who was born in 1861, and his daughter Louisa Ann was visiting her cousin in London. Louisa Ann and Charles Richard Palmer were both christened at St Swithun’s in 1867, and the family lived in Church Street. Charles Palmer died in Swanbourne in 1875 aged 51, leaving Charles Richard Palmer and Louisa Ann Palmer, and then Charles Richard Palmer died in London in 1880. By 1880, with her parents and her brother all dead, Louisa Ann Palmer was left alone in Swanbourne aged 21. In 1883 she went to Nebraska to join her uncle Samuel James Palmer’s family in Nebraska. However, her uncle in Nebraska had already died in late 1877, but his two son’s who had originally been born in Geelong, Australia, were still living in the USA, so she must have joined them, her first cousins. She married, and she still has descendants living in Nebraska, USA. In 1887 she married John Vallis at Lincoln, Nebraska and they lived at 3175 South 16th St, Lincoln, Nebraska and she died there in 1948. The descendants of the Palmer family of Swanbourne now all live in the USA. Bucks Herald, Swanbourne parish registers, census returns, especially 1861. Additional sources:- Ancestry website. A big thank you to LeAnn Vallis Fejan, Great Granddaughter of Louisa Palmer for sending recent family information and photographic supplements.